This range of highly detailed etched miniature scenic items was originally conceived for model railway use but the breadth of the range makes them ideal for use in many other applications including architectural models and dioramas. 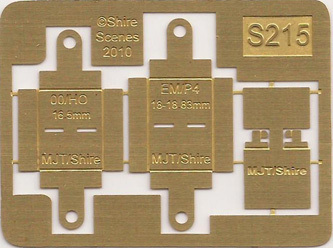 Most items in the Shire Scenes range are modelled to a scale of 1:76 (4mm - 1ft), making them suitable for use on model railways built to OO, EM and P4 gauges. 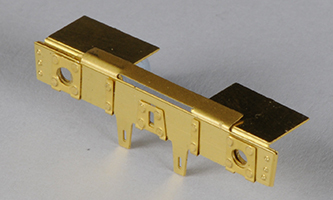 Several of these items are also modelled to a scale of 1:152 (2mm - 1ft) suitable for N gauge. Some items are modelled to a scale of 1:87 (3.5mm - 1ft) making them suitable for HO gauge or for use in 1:76 scale landscapes to represent 'smaller versions' or, in the distance, to create false perspective. Additionally, certain items are modelled to a compromise scale of 1:80 making them suitable for use in either 1:76 or 1:87. 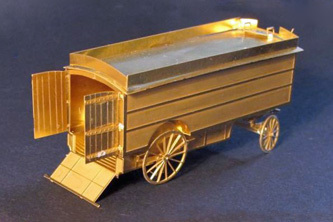 Items are cast metal or etched brass and are supplied unpainted and un-assembled. These items are manufactured by Dart Castings.